One of the most effective early Hunter-Killers, the K-9 was considered extremely deadly during times of war. However, as with nearly all Klingon hunter-killer designs, the K-9 proved nearly useless during peace. Fortunately for the backers of the K-9 design, peace was a truly rare thing in the empire. The K-9 was one of the earliest known quad warp engine designs successfully fielded by the Klingons. The engine design was awkward for the time, but proved effective during combat and patrol. The main warp drive consisted of two primary warp nacelles and two “backup” nacelles. Any one of the four nacelles could operate in conjunction with any other nacelle to provide the space-warp capability for FTL travel. Normal operations saw the outermost warp nacelles used for propulsion while the inner nacelles were powered up and used to support the primary weapons. This gave the vessel additional emergency combat power that often turned the tide of battle. The K-9 was not only well armed, but well armored with extensive hull plating, making it a truly dangerous opponent in battle. The K-9 used three different main weapon systems. Four standard multi-vector disruptors were able to engage multiple targets at short range, giving the K-9 a powerful close-in punch. A single mid-range medium cannon was mounted on a turret amidships, allowing the system to track targets while engaging them. This cannon allowed the K-9 to fire a continuous plasma beam rather than the traditional pulses from more mainstream disruptor weapons. A large heavy plasma cannon was installed, allowing a significant punch during battle. The heavy cannon also incorporated a continuous plasma stream – drawing direct power from the secondary warp engines. The K-9 was not without it’s faults, though. The main disruptor turret was difficult to use effectively. Reports of overloads and power surges when the turret was casually used were not uncommon. Experienced crew found the turret more effective than standard disruptor weapons; less well-versed crews often caused as much damage to the power grid as to enemy vessels. The large disruptor cannon – essentially an overpowered forward locked disruptor bank – was even more difficult to use effectively. Overloads in fire control as well as targeting were not uncommon when the canon was used continuously. Several crews reported significant damage when the disruptor cannon back-fed power to the main plasma systems. Like it counterparts, the K-9 was cramped as well as difficult to maintain. The unique power plant required constant monitoring and adjustments to ensure peak combat efficiency. The K-9 was also short ranged, with typical patrols no longer than 3 months. No provisions were made for live food, recreation or other crew support systems. No medical facilities were provided, and hot-bunking was a standard practice. Even the captains quarters were shared with the First Office. While glory was abundant for those who served on ships, conditions were harsh in the extreme. Several sub-systems were also known to be prone to breakdown and overload during combat, further increasing tension on-board. Despite it’s numerous difficulties, the K-9 proved invaluable against a wide range of targets. They K-9a was built in limited numbers due to the difficulty of specializing the various weapon systems. It’s effectiveness against Kinshya and Romulan targets could not be denied and over 60 were fielded before the introduction of the K-9b. Of the 68 K-9a’s officially fielded, 3 are listed as missing, 22 have been destroyed, 17 have been scrapped, 7 have been captured (3 by Star Fleet, 2 by the Romulans and 2 by unknown forces in the Triangle), 8 have been sold to the Romulans, 3 have been traded to the Orions and 8 are in reserve fleets. The ‘B’ model improved all three of the major weapon systems and included the powerful KSI shielding system. 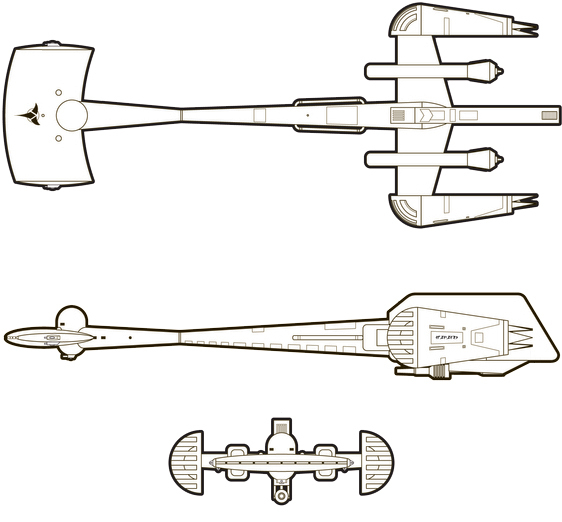 With the streamlining of the weapon production, the ‘B’ models was fielded in larger numbers and was the first to see combat against Federation opponents. However, the most significant of the K-9 models would be the K-9c. Built on the eve of the Four Years War, the K-9c was as powerful most Klingon cruisers of the day and easily outgunned most destroyers and escorts. Conversion of older models was well underway when the war officially began, and the K-9 was instrumental in the empires early success. Of the 161 K-9b’s launched, 6 are listed as lost, 78 have been destroyed, 14 have been scrapped, 4 have been captured (2 by Star Fleet and 2 by the Romulans), 21 have been sold, 9 have been traded to the Romulan, 9 have been traded to OFMA, and 20 are in reserve fleets. Even with the K-9c’s success, the war began to turn. When nearly a dozen K-9’s were destroyed in a battle near Argelius, the empire rushed the K-9d into production. Although the K-9d could have been a game changer with firepower equal to vessels twice its size, the ‘D’ model never addressed the light crew, heavy automation and short range that kept the K-9 close to home ports. When officially introduced, the K-9d was brought into the conflict just as the empire was being outgunned and over-matched. With two-to-one odds favoring the Federation, the K-9d could not be produced in sufficient numbers to halt the eventual Federation victory. Of the 107 K-9c’s fielded, 1 is listed as missing, 61 have been destroyed, 19 have been scrapped, 6 have been captured (4 by Star Fleet, 1 by the Romulans and 1 by unknown forces in the Triangle), 14 have been sold (10 to the Nausiccans, 2 to Orions, 2 to Barolians) and 6 have been traded (4 to the Romulans, 2 to Nausiccans). The wars end in 2256 saw massive reduction in fleet spending, and production of the K-9 (along with many other vessels) dropped significantly. By 2262, production of the K-9 was halted in favor of more versatile front-line vessels. The K-9c and K-9d continued to serve until well into the 2270’s. As with a number of other older designs, the K-9 was sold to a wide range of buyers along the Neutral Zone and within the Triangle. The K-9d became a favorite with Nausiccans who’s systems easily replaced the older Klingon components. Several Orion pirate families also traded information and material for K-9d’s with the intent of using them as raiding vessels. Of the 64 built, 4 are listed as missing, 21 were destroyed, 3 were scrapped, 2 were captured (1 by Star Fleet and 1 by the Romulans), 16 were sold (10 to the Nausiccans, 4 to Orion Families and 2 to private interests in the Triangle), and 10 were traded to the Romulans. 8 are in use by ranking families in the Empire. Power Units Available – 5 ea. 5 ea. 5 ea. 5 ea. Additional Power: Captains of the K-9 may declare at the beginning of any Turn that they are using the reserve power available from one of the two support engines. They may add 5 points of power to their power total for that turn. The power continues to be available until used for weapons or shields. Once used, the power from that engine is no longer available. Players may use the power from the second support engine after the power from the first has been used up. Once the power from both engines is used, the reserve energy is used up for the reminder of the scenario. The power will replenish if the ship is used in another scenario or campaign setting. Power lost due to damage during combat is unavailable if not already used. Disruptor Turret: Captains of the K-9 may declare at the beginning of any Turn that the ‘p/f/s’ disruptor is tracking a vessel that is within the weapons range. A disruptor turret that is tracking must be fired in phase 1 or phase 2 of that turn. If the attack is successful, treat it as a normal attack. If the initial attack fails, the captain of the K-9 may make a second attack in the following turn for half damage, if successful. If an initial attack is unsuccessful and the targeted ship moves OUT of range of the disruptor turret, the power “back-feeds” and causes half the weapons damage to any warp engine. Disruptor Cannon: The main ‘f’ disruptor cannon is treated as a standard disruptor during the scenarios. However – the captain of the K-9 may choose to double fire the ‘f’ cannon during any one turn. Sufficient power must be available to double fire the cannon. The K-9 take damage equal to 1/2 (round up) the normal damage of the cannon. This damage may be absorbed by the forward shield (if active) or distributed to the engines and hull in any amounts the K-9’s captain wishes. A double fired cannon must attack the same target for both attack rolls.